PT Garuda Indonesia (Persero) Tbk - Garuda Indonesia or referred to as "Garuda Indonesia Group" is a leading and reputable state-owned company in Indonesia with a core business in airline industry. The majority of Garuda Indonesia’s shares (stock code IDX : GIAA) is owned by the Government of Indonesia with 60.5% shares ownership. Other 39.5% remaining shares in Garuda Indonesia Group was owned by Credit Suisse AG Singapore TR AC CL - PT Trans Airways (24.6%) and public (14.9%). Based in Soekarno–Hatta International Airport Cengkareng (near Jakarta), Garuda Indoensia runs its business through 180 fleets, flies to over 40 domestic destinations and 36 international destinations (as at the end of August 2015). Its fleets include 137 Garuda's main board fleets, and 43 Citilink's fleets. Garuda Indonesia also supported by 2 strategic business units (Garuda Sentra Medika Business Unit and Garuda Cargo Business Unit) and 5 subsidiaries, namely PT Aero Wisata, PT Citilink Indonesia, PT Abacus Distribution Systems Indonesia, PT GMF Aero Asia and PT Aero Systems Indonesia. Garuda Indonesia has shown significant performance improvements in 2015. 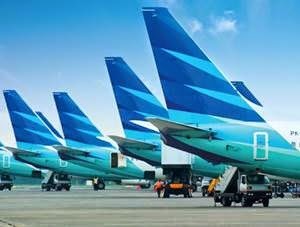 According to PT Garuda Indonesia (Persero) Tbk Annual Report 2015 as cited by JobsCDC.com, Garuda Indonesia successfully obtained total profit for the current year (2015) at US$ 77.97 millions as compared with loss US$ 368.91 million in 2014. Indonesian Citizen (WNI), age max. 27 years old. Single and willing not to get married during training period. Minimum Bachelor (S1) holder from a leading university, majoring in Electrical Engineering, Mechanical Engineering, Aeronautical Engineering, Industrial Engineering, Business Management. GPA min. 3.00 (S1) and 3.25 (S2) within 4.00 scale. Fresh graduate or those with 0-1 year of working experience. Possess excellent communication skill in English, both verbal and written. Actively involved in campus organization activities and event/social committees, or has received recognition and award on achievement acquired e.g. scholarship, student exchange, etc. Willing to be placed to unit and branch office in accordance with company requirement. JobsCDC.com now available on android device. Download now on Google Play here. Please be aware of recruitment fraud. The entire stage of this selection process is free of charge. PT Garuda Indonesia (Persero) Tbk - Management Trainee Engineering Program Garuda August 2016 will never ask for fees or upfront payments for any purposes during the recruitment process such as transportation and accommodation.